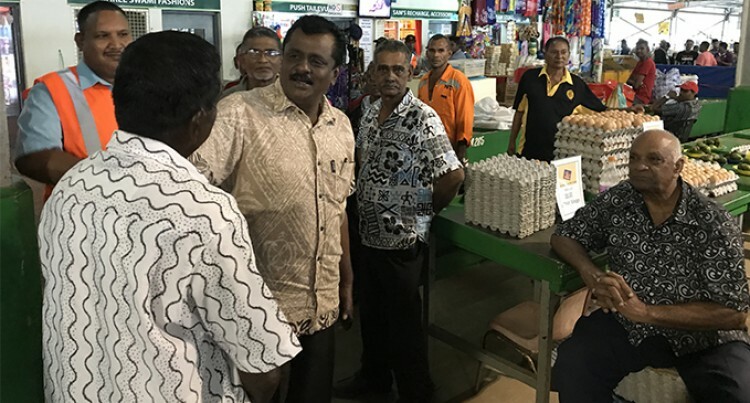 We will do our part to strengthen the security at the Nausori Market, says Parveen Bala. Vendors had raised concerns after the market was broken into last week. Mr Bala said Nausori Market was big and they needed to strengthen the security at the market for the safety of the vendors and their items. “Today I visited the market and the vendors who were affected in the robbery,” Mr Bala said. “They had called me last week, but as I was in the Western Division. I paid them a visit today. “What we need to do is to strengthen our security at the market. It is a very big market. “I have directed the Nausori Town Council to increase security officers to four. “Currently there are only two security officers at the market. “The vendors are happy that the security numbers will increase,” Mr Bala said. He said within a month’s time, they would install the CCTV cameras in the market for security purposes. “Unfortunately, the vendors and shops owners who have their CCTV cameras are not coming forward to assist in the investigations,” Mr Bala said. “People will have to come forward and assist us in the investigations so we can get hold of the culprit. I have been told that the Police are investigating because they have some suspects and we will get to the bottom of the issue. “This is the second time the Nausori Market has been broken into. “We have seen and heard the grievances of the vendors and the Nausori Town Council will now act on it. “We are also going to strengthen all the securities that we have above the roof. “We are going to remove the mesh and install security grills and from the inside we will install the mesh to have double security for the vendors,” Mr Bala said. Police spokesperson Ana Naisoro said they were investigating the incident.